NABAKALASH, Bangladesh — Sufia Khatun wears a green sari around her thin 76-year-old frame. Round gold-rimmed glasses perch on her wizened face. When she smiles, she reveals teeth stained brown from betel nut. She has lived all her life in this village in Matlab, a sub-district in central Bangladesh. For Sufia, something has remained constant in Matlab since she was a young woman: regular visits from data collectors from the International Center for Diarrhoeal Disease Research, Bangladesh, a public health institution that today identifies itself simply as icddr,b. For five decades, they have recorded census and health data from Sufia every two months. As her family grew, they also collected data from her daughter Fatema, now 46; her granddaughter Salma, 26, and now Nadia, her six-month-old great-granddaughter. Matlab is not just the name of a region. It is synonymous with the rural research site of the center, whose headquarters is 34 miles away in Dhaka, Bangladesh’s capital. By coincidence, Matlab means “idea” or “plan” in Bengali. In addition to O.R.S., treatment programs for vaccines, zinc for childhood diarrhea and other public health practices were tested at Matlab before they were included in national health programs in Bangladesh and eventually in international protocols. Data was essential to these advances. That work in Matlab began in 1966, when researchers began tracking demographic and health data from about 28,000 people. The research center now collects data from about 220,000 people in Matlab, and has become the longest-running health surveillance system in the developing world. This trove of nearly 50 years of data has changed the way health research in developing countries can be monitored and evaluated. Matlab also became a model for other systems that study health data collected over time, such as the global Indepth Network, which operates in 20 African and Asian countries. Census and health records are not to be taken for granted in Bangladesh and other poor countries, where vital information about births, deaths and migration, as well as socio-economic and health data like income and contraceptive use, were virtually nonexistent decades ago. Today, the center’s data collectors travel to 142 villages in Matlab by motorbike, bicycle and foot on narrow roads that wend through a landscape of rice paddies and small homes with mud foundations. One morning, Bashir Uddin, a field research officer, spent 45 minutes recording information from four generations of Sufia’s family in their humble tin-roof house. Uddin has been a field officer since 1999, when she recorded information with paper and pen. The center started using computers to track information in the early 1980s. Ten years ago, data collectors began using hand-held devices, and today Uddin uses a digital tablet. Although digitizing the information has helped streamline data entry and reduce errors to about 1 percent, field supervisors still independently crosscheck the data. Some of the life-saving health treatments developed at Matlab have been products of accident. When the center was testing a cholera vaccine in the 1960s, for example, it used common tetanus toxoid vaccinations as a control. Later, it was discovered that if women were pregnant when given the tetanus shots, their survival rate and that of their infants increased significantly, because both had become immune to tetanus – a risk when umbilical cords are cut with unsterilized blades. This discovery in 1974 eventually led to a recommendation by the World Health Organization to give tetanus inoculations to all pregnant women. The large amount of historical data collected at Matlab also allows researchers to study health impact retrospectively. For example, one group sought to understand whether malnutrition among pregnant women would affect their children’s health as adults. 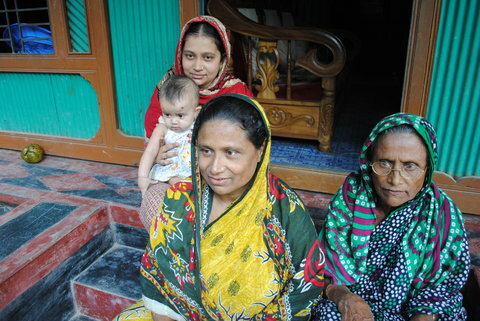 Nearly 30 years after Bangladesh’s 1974-75 famine, they looked at health records of women in Matlab who were pregnant during that calamity, and interviewed their now-grown children. Indeed, this group showed three times the risk of pre-diabetes compared with those whose mothers were adequately nourished during pregnancy. The free, fast treatment for cholera that the research center developed in Matlab was essential to gaining the community’s trust. The organization began as the Cholera Research Laboratory, which was founded in 1960, when Bangladesh was still part of Pakistan. That project was supported by the American-backed Cold War alliance known as the Southeast Asia Treaty Organization. The lab’s researchers needed a place with a large population where cholera was endemic but that was relatively close to Dhaka, where samples could be analyzed. Frequent cholera outbreaks often decimated whole families back then, and sometimes entire villages. The research center transported sick patients to its small clinic via speedboat and put them on lifesaving intravenous drips that were expensive or unavailable elsewhere. Researchers tested not only medicine like cholera vaccines, but also ways to raise awareness and change behavior in poor communities. For example, the center pioneered “community health workers” in villages. These were local women with some high school education who went door to door to teach village women about contraceptives, pre- and postnatal care and reproductive health. The organization studied the impact of the information that health workers conveyed, as well as the supplies they carried. Those steps may seem obvious in hindsight, but employing educated female community health workers in poor rural areas was groundbreaking. The model has since been replicated in other countries. The center estimates that the number of annual childhood deaths in Matlab has dropped 75 percent in the last 25 years, a result of combined programs in child health and family planning. And across Bangladesh, deaths of new mothers have declined 40 percent from 2001 to 2010. The results of the research center’s programs are often compared to a baseline population in the area who have access only to standard government health services – potentially a divisive issue in the community. But that problem is mitigated by the center’s policy of keeping its 120-bed hospital in Matlab open to all, and its provision of free treatment of diarrheal disease, maternal services and child health care. Annually, the hospital treats more than 30,000 people, many of whom come from outside Matlab. Although clinical tests on the poor have been controversial in other countries, work at Matlab has gone relatively smoothly. The center requires consent from all participants. Research protocols are reviewed by an ethical review committee bound by international standards. The center also won trust by helping villagers survive devastating diseases by distributing already licensed treatments, like tetanus toxoid vaccine. In the 1970s and early 1980s, 200 to 300 newborn babies died of tetanus each year; by the late 1980s, virtually none did. Researchers stayed in the community for months or years. A team of largely American and Bangladeshi doctors and scientists initially lived and worked in a converted old prison barge that served as a clinic and lab. Even during the bloody 1971 civil war in which Bangladesh became independent from Pakistan, researchers stayed put to treat patients during a cholera outbreak. In 1990, the center began building larger, permanent hospital and lab facilities in Matlab. Today, the rusted barge remains on the grounds as a relic. The center is the largest employer in Matlab, with hundreds of staff members from the local community. To keep the flow of funding coming in over the decades, Matlab has historically conducted a diverse range of research — “at least 15, preferably 20-25 studies simultaneously,” according to Dr. Streatfield. Currently, there are about 30 studies, on subjects ranging from flu and rotavirus vaccines to the impact of clean cookstoves on lung health. Basic health in Bangladesh has improved considerably in recent years. Five decades ago, 60 percent of children did not survive to adulthood in Matlab, but now more than 90 percent do. Yet Matlab faces a larger existential challenge. Today, illnesses and deaths are more likely than before to result from noncommunicable chronic diseases like diabetes, heart disease and cancer, which are harder to treat than familiar communicable diseases. In Matlab, 80 percent of deaths are now from such causes. This poses questions for the center’s future work in Matlab. Should it shift focus to noncommunicable diseases although its expertise is in diarrheal illness and diseases associated with poverty? This would pose different challenges since noncommunicable diseases tend to persist for years and treatment is often very expensive. There are also large, open-ended health challenges in Bangladesh like the impact of dwindling fresh water or the consequences of climate change. “The question now is: are we still doing relevant research that the world is demanding?” Dr. Streatfield asked. That clearly will be something that the next generation at Matlab must consider.